January | 2014 | I run. Quite a lot. It makes me happy. 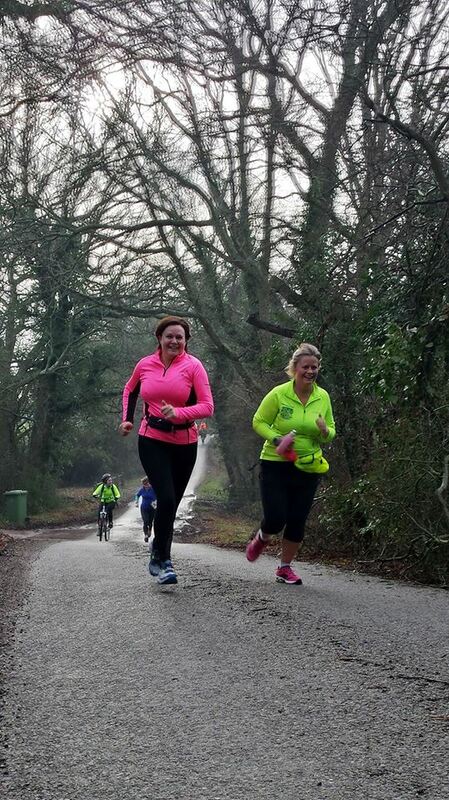 January at parkrun was fantastic. We managed to avoid the rain on the day of the event, but there was often standing water at the bottom of the course and the finish area is a bit of a mess. Still working on that. We averaged over 120 people per week, with 481 people completed the course in the 4 weeks in January. I am keen to encourage local running groups / fitness groups to visit parkrun on a Saturday morning as a social event for the group to get together and also have a lovely 5km trot around a park. 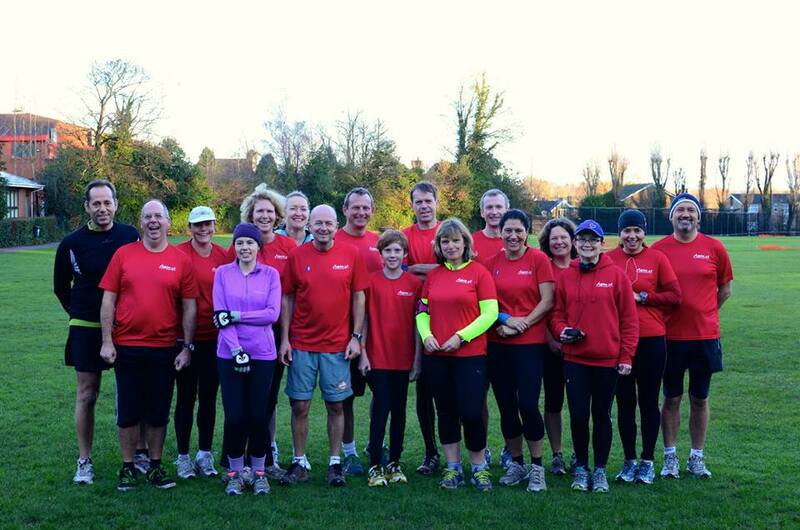 It was really lovely to welcome the Aspire ‘We Run Hassocks’ group on the 11th January. There were 17 or 18 of them and I recognised quite a few of them from passing them on the streets of Hassocks. They share the same ethos that we do at parkrun. There is a big range of abilities and everyone is extremely encouraging to each other. It was also really nice to present t-shirt to quite a few juniors this month. Lily and Lewis have both run all of their parkruns at Clair, so may not have been parkrunners if we hadn’t launched in Haywards Heath. 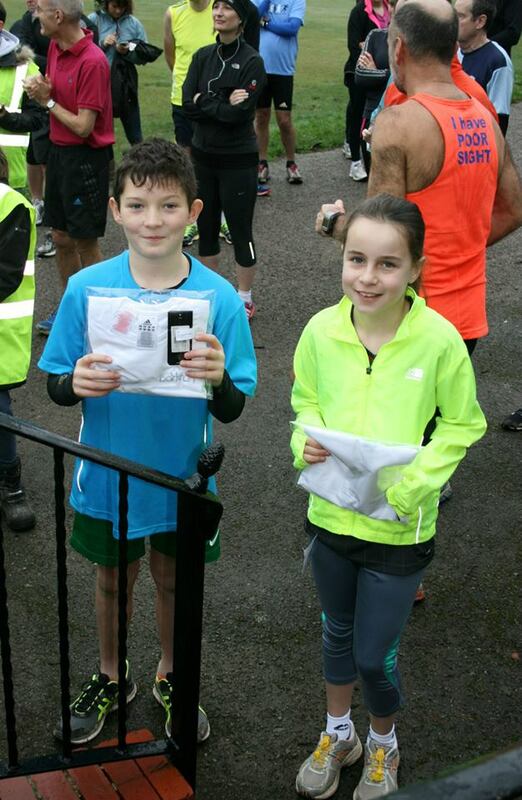 They are both from families who have really embraced parkrun as well, as siblings and parents are also running regularly. 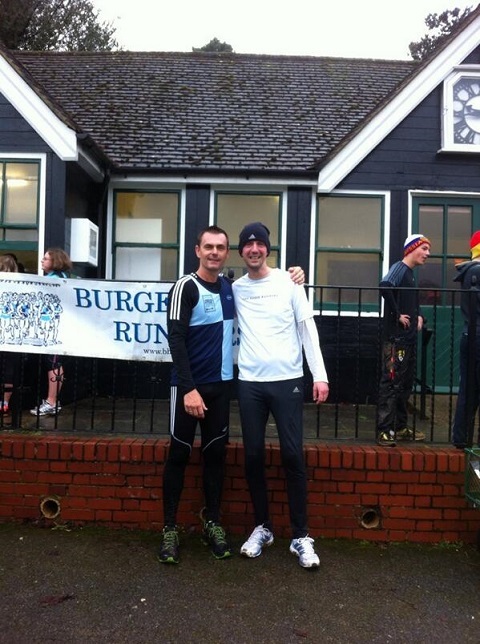 We also presented December’s parkrunner of the month. It’s becoming increasingly difficult to decide on the parkrunner of the month. The folks at Tilgate warned us of this. The awarded Jay with the award and here are his new shoes courtesy of Sweatshop. Jay and his family have become and massive part of the parkrun team and there does seem to be a hole if they are not there. 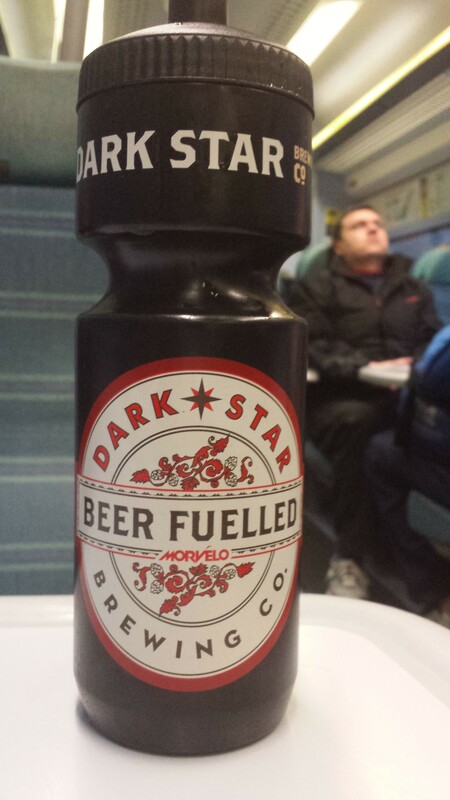 I wasn’t due to run the Dark Star Ultra Marathon. In fact I’d promised myself that I would not run a marathon again after having a knee operation in 2012. 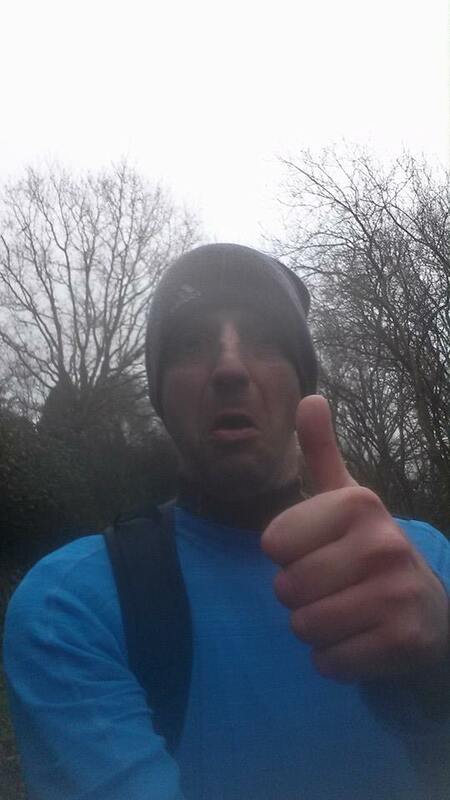 However, due to the fact a friend from Burgess Hill Runners was unable to run due to injury, and place was available and the common consensus on social media was that I should ‘give it a go’. 2014 has been the wettest that I can remember for quite some time and during the weeks leading up to the Dark Star Marathon it became increasingly obvious that it was going to be tough. 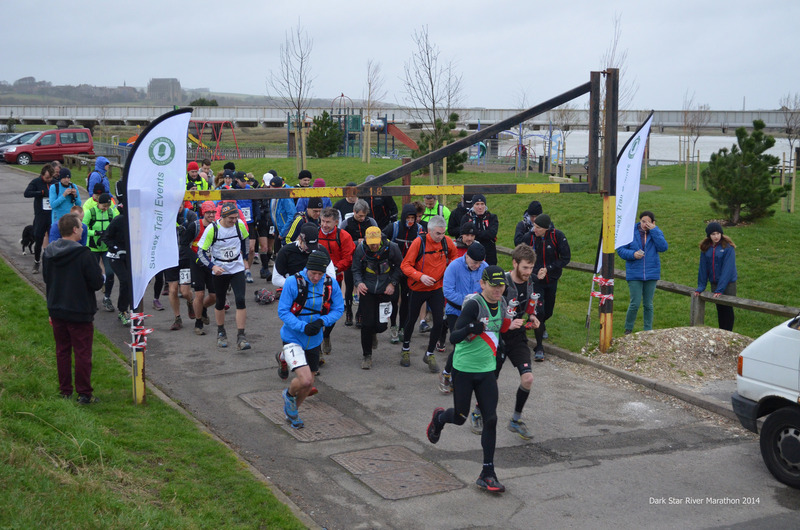 The course involved 14 miles due north from the coast at Shoreham by Sea along the banks of the River Adur and along the Downlinks path to the turning point at the old West Grinstead Railway Station. It was then 14 miles back along the same section of the Downslink path and along the opposite side of the riverbank back to where we started. I had no idea what to expect. I had never run above 13 miles off road and had only completed 20 miles on road during my training. 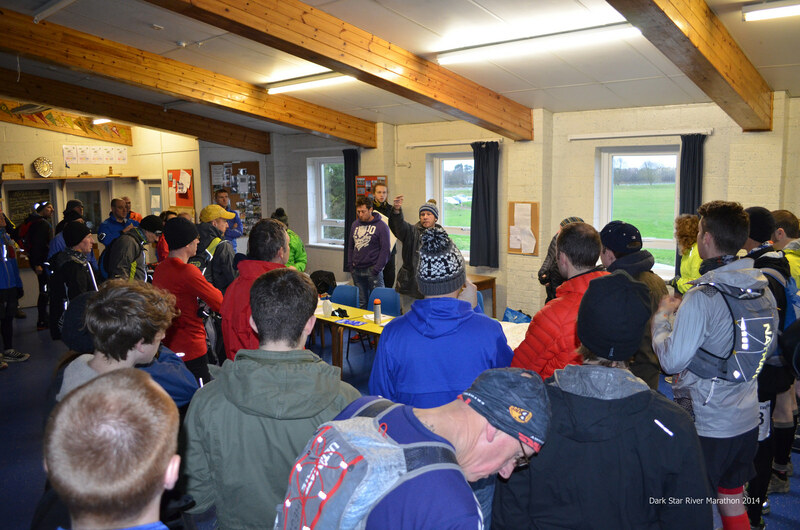 On arrival for the pre-race brief, I noticed that everyone seemed to have all the kit. I had no waterproofs at all. I felt seriously inexperienced and increasingly nervous about what lay ahead. The brief was very informal, encouraging and with a real emphasis on the conditions and staying safe. I had a plan. I’m normally pretty useless at sticking to plans. I usually get a quarter of the way into a race and think I’m much better than I am and totally mess it up. I was determined not to do that this time. So off we go. 55 of us. I’m at the back (or pretty close to it). There was a 6 and a half hour cut off time and I had a finish time of 5 and a half hours in my head. There was a good contingency there if it all went horribly wrong. We started off with the wind at our backs and on very good tracks. Knowing that the rain would soon arrive, along with the mud and the head wind after the half way check point, I decided that the first half of the event would definitely be quicker than the second half (I wasn’t wrong). Conditions worsened dramatically. The mud arrived much earlier than expected, as did the rain. As the rain was at our backs, I was lured into a false sense of security and made very good progress. 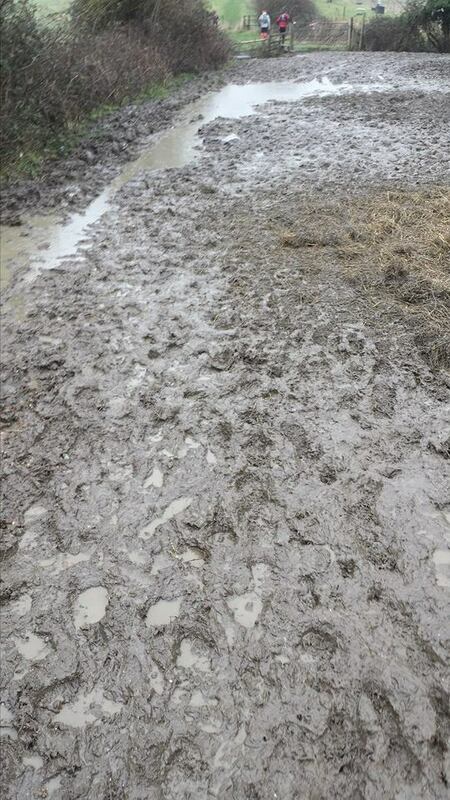 The main issues on the way out were the mud and the stiles. The stiles totally knock you off your rhythm and the mud all round them made them very difficult to navigate. The nature of the course meant that the front runners passed you on their way south. 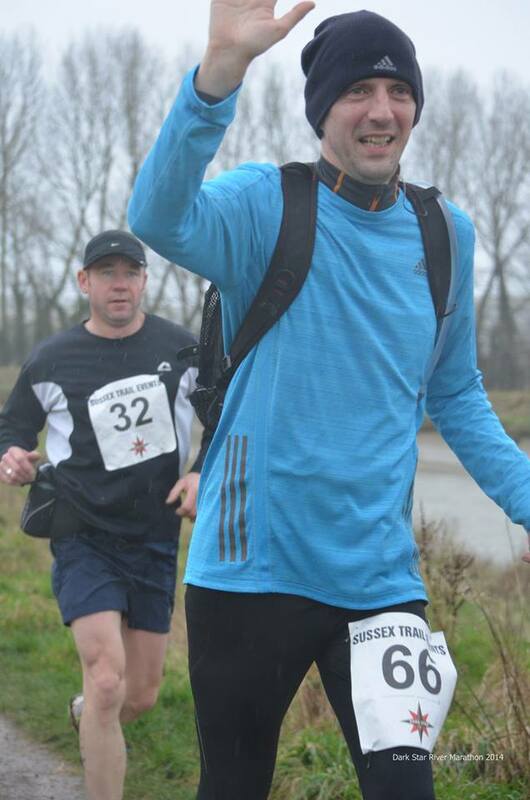 I had a huge lift as a crossed Paul Sargent, a fellow Burgess Hill Runner, when I was at 12 miles and he was around 16 miles. He looked a strong as an ox and nearly took my arm off when we high fived. That gave me a new spring in my stride as I headed up the Downlinks path to the turn round point. My wife, Nick was there waiting for me with some coffee and some Christmas cake. They were also serving hot soup, hot drinking and different types of food. I got there in 2 hours 20 minutes. This was too quick (inevitably). I didn’t think that it was too much of an issue as I knew that the home leg was going to be much tougher and I still had the cut off time in my mind. So, after 5 minutes, I set off into the wind. ‘It’s not too bad’ I thought. I was right for the first 3 miles, as we were on the Downslink path. As soon as we arrived on the open spaces on the riverbank it soon became evident that it was going to be painful. My pace dropped. No problem. I knew it was going to happen. Then came the stiles. They were quite close to each other on the way back. On the first one my thigh cramped is a climbed over it and my calf cramped on the way down. This happened at the next dozen stiles over the next 6 miles or so. I have never been so cold or in so much pain from cramp. At one stage I reached up to grab a post to pull myself over a stile and my arm cramped up. I was sodden. My clothes were totally drenched and my camelback dripping wet. I was now starting to look at my watch at too regular intervals. I didn’t seem to be getting anywhere. I was checking it every 5 minutes as my frustration with the conditions and the cramps grew. I only realised at 24 miles that I had accidentally hit the ‘stop’ button about 6 miles back. I have seen on TV programmes about feats of endurance that you stop thinking rationally and that must have been what happened to me. I was that cold and tired that I didn’t compute that my watch had stopped. At least now, the panic of missing the cut off time had gone, as I was 6 miles further on than I had thought. It was at the 24 mile checkpoint that everything changed. Nick, my wife, Jon and Steve (both from BHR) greeted me and I immediately knew I would finish. The lift was amazing. They told me that several seasoned Ultra runners were saying that it was brutal and was of the toughest events they had done. That was it. The doubt was lifted and there was no way it was going to beat me. Nick, Jon and Steve helped me to change the clothing on my upper half and they took my camelback off me and I set off with 4 miles to go. I speeded up and actually enjoyed the majority of it. For such a difficult event the finish was totally underwhelming. No fanfare. There was no funnel, just a couple of flags and 2 poor ladies checking us in. They must have been freezing. This was extreme volunteering. It didn’t matter. I’d done it. I am an Ultra Runner. I made the cut off time by nearly half an hour (official finishing time 6 hours 3 minutes). I didn’t enjoy all of it. In fact there were sections that I hated. It didn’t matter. I’d finished. If fact, all 55 starters finished. A huge thank you to Nick, my wonderful wife and Jon and Steve for their support. Without them I would not have finished. The hospitality at the end was amazing. There was free food for the runners. There were hot showers and a free massage. This is an event that I would recommend to anyone. Not in those conditions, but you don’t get to choose the conditions when you enter the event. Right then, what’s the next one then. 30+ miles next time I think. There was a quick change of plan this week. My mobile phone was constantly buzzing for about an hour on Friday night, which usually means that my name has been mentioned on social media and comments are flying in about it. 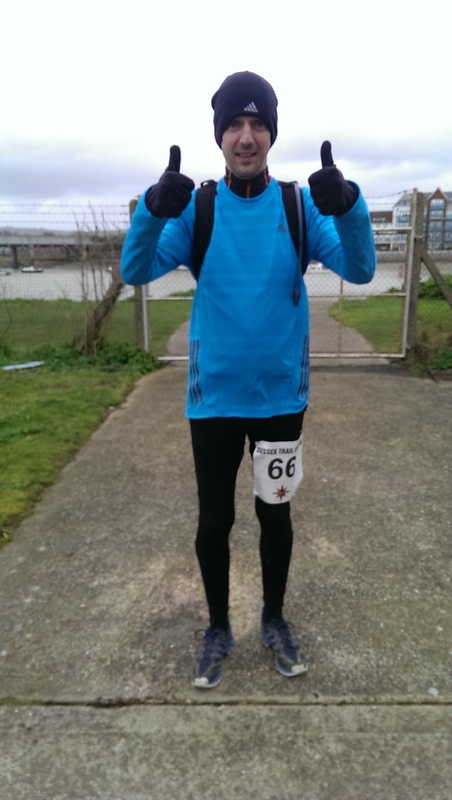 Next day when I read through, I found out that there was a spare place on the Dark Star Marathon (28 miles up and down the River Adur), and my name had been suggested as a possible candidate to take up the challenge. This was not in the plan. 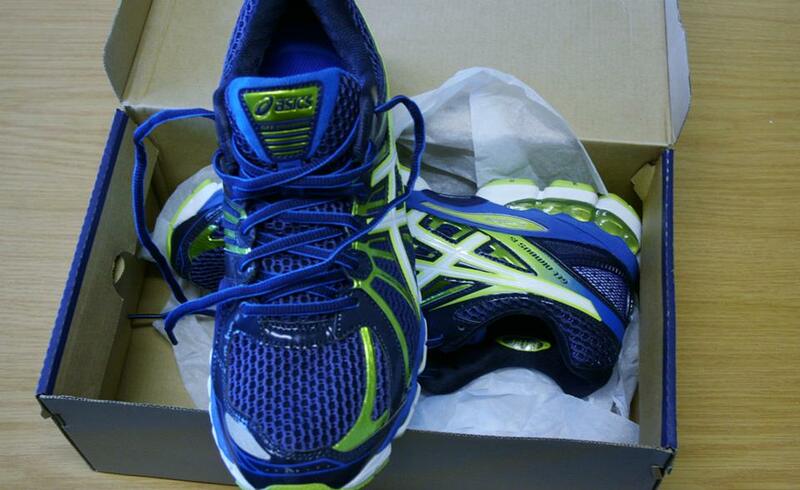 I had only planned to do the Brighton Marathon. The Steyning Stinger Marathon then got shoe horned in a few weeks before Brighton and now this carrot was dangling. It was only a week away. The idea of going further than marathon distance had always been attractive, so sod it, I said yes. Sunday was supposed to be long slow run day. It now turned into very long slow run day. 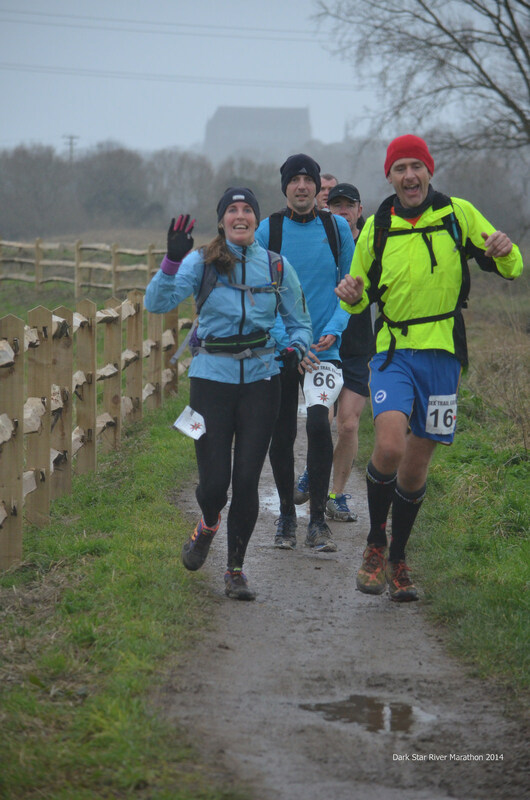 Nick and I ran over to Burgess Hill to meet up with the club group, we did about 11 miles with them and then I added another 5 miles onto that to make 20 miles. I really wanted to prove to myself that I could make 28 miles by completing 20 mile the week before. That was the confidence boost I needed and I did it. 2014 started as 2013 ended, wet and windy. For the first time ever, I am starting a year with 2 marathons planned with the support of a running clubs and the help that it provides. I have decided upon the training plan which is a 4 day a week sub 4 hour plan which Action Aid offer to their athletes taking part in the London Marathon. I’m not totally bothered if I don’t go under 4 hours at Brighton. It’s a huge chunk off my PB, which currently sits at 4 hours 20 minutes. However, I am now a little wiser and will put in the required training. The first week of Marathon training was pretty easy to be fair. The long run doesn’t really get long for a while on the plan, as I was already running 10 miles plus at the end of last year. 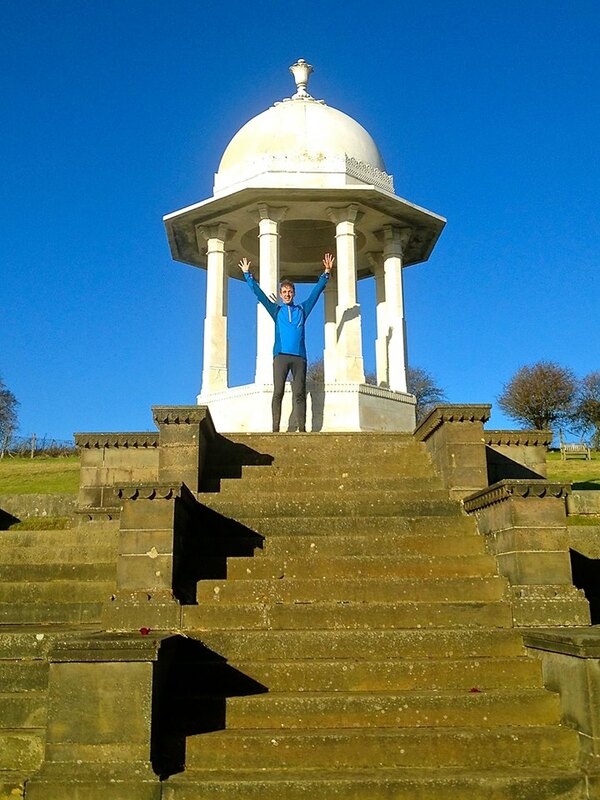 I ended 2013 with a lovely 8 miler over the Downs to the Chattri Memorial with Jay, followed by Clair parkrun on Saturday and 15.5 miles around the local area with the Burgess Hill Runners group on Sunday. For me running was always a solo activity. It was me time. Time for me to listen to music and get my head into gear. This was the first time I had been out with the BHR group. It is a group of mixed abilities and the faster runners doubling back every so often to keep the group together. The miles seem to fly by when you have the chance to chat and take your mind off looking at the watch. It is also great to get out at the weekend. I really hate running in the dark. You are limited as to where you can go and you cannot go off road. Midweek runs are limited to the pavements around home and the first full week of Marathon training was completed with 5 steady miles on Tuesday, 6 and a half tough miles at BHR track night and a slow 3 mile plod on Friday night. parkrun on the 4th was a pretty special one for me. I had been looking forward to the New Year and the inevitable bounce in numbers that the New Year brings. parkrun has never really been a question of numbers for me, more a question of creating a welcoming atmosphere for people to enjoy themselves. However, the lure of getting an attendance in 3 figures each week was pretty strong. We had 91 runners today as well. Given the bad weather, not a bad figure. 100+ here we come. I have been conversing on Facebook and Twitter for a while now with the McGaw family who are heavily involved with parkrun in New South Wales in Australia. 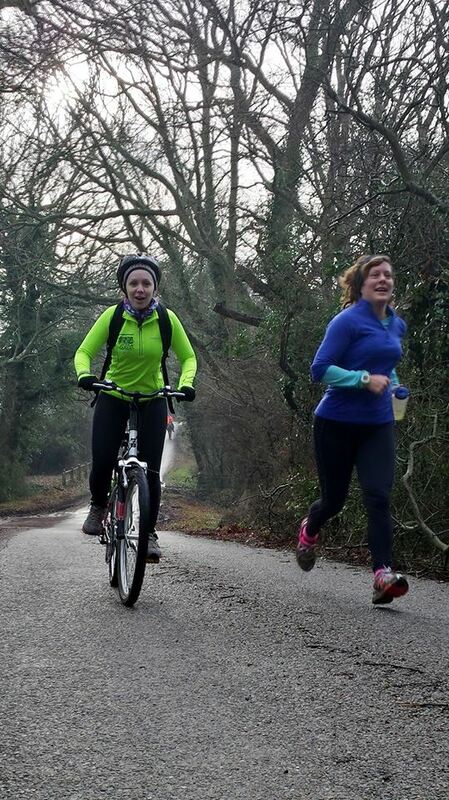 They are in Sussex visiting relatives and have decided to tour round 3 Sussex parkruns. They have already visited Hove and Preston Park before coming down to Clair. It was brilliant to swap running tops with David and to meet the whole family. I bought a cake from the Real Patisserie and decorated it with the relevant flags. 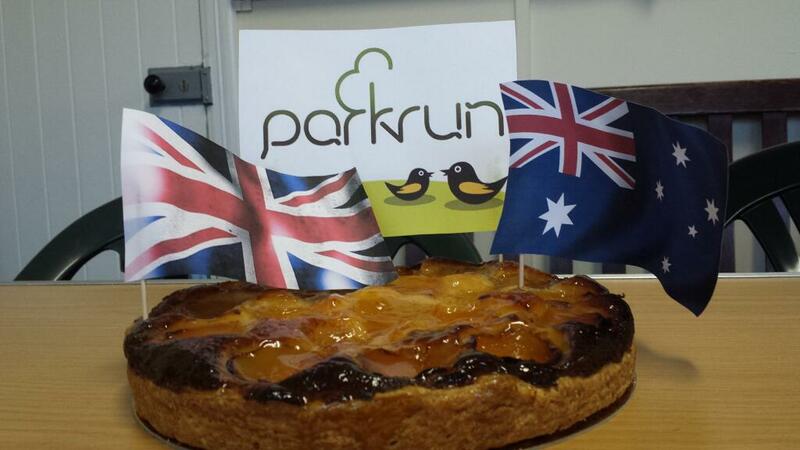 It is really interesting to see that the parkrun experience over the other side of the world is the same as it is in the UK and it is fantastic to meet such like-minded people trying to achieve the same as us. It was a real eye opener to talk about the increasing obesity problem in Australia and worries that they have over here. Given that they are such a great sporting nation with the outdoor lifestyle that we perceive, it is hard to imagine that this is such an issue over there as well.